A housing project comprising thirty-five houses constructed at a cost of about 3.46 million rupees for the returnees of internally displaced Tamil families implemented by the Trincomalee Rotary Club with the financial assistance of German Technical Co-operation (GTZ) was declared open Saturday at Varothyanagar, a suburb in Trincomalee town by the Rotary Governor Mr. Gamini Jayawardene. GTZ, a company owned by the Government of the Federal Republic of Germany is one of the official planning and implementation agencies for the official German Development Cooperation, sources said. Dr.Genitz Dedo, the head of the GTZ-Integrated Food Security Programme (IFSP) in Trincomalee watering newly planted coconut sapling while Mr.Gamini Jayawardne looks on from behind. Mr. Gamini Jayawardene with the team leader of the GTZ-Integrated Food Security Programme (IFSP) in Trincomalee Dr.Genitz Dedo declared open the newly constructed first house in the project which belongs to Ms Sittampalam Chandra Devi, a widow mother of five children, all are girls. Trincomalee Rotary Club President Mr.R.Rajarammohan handed over the keys of the house to her. 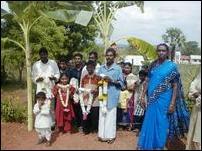 Later the guests planted mango and coconut saplings in the premises of new houses. "This year Rotary theme is LENDING A HAND. We must lend a hand to alleviate poverty, educate the illiterate, to relieve the suffering of poor and the community," Mr. Gamini Jayawardene said addressing a gathering of internally displaced families from Vanni and other areas at the opening event." Vanni returnees await with garlands for the arrival of guests in front of one of the newly constructed houses in Varothia Nagar. Returnee families look on guests entering one of the newly constructed houses in Varothia Nagar. He added," we must also lend a hand for our government to achieve permanent peace in the current peace process." In the sphere of alleviating poverty this is the start in Trincomalee and we have given a roof over the head of returnees to restore normalcy in their livers after suffering several years elsewhere, Mr.Jayawaradene said. Mr. Rajarammohan presided. Dr.Genitz Dedo also spoke. President of the Varothia Nagar Rotary Village Corps Mr.S.Sakthivel who had been a refugee since 1987 said that houses provided by the Trincomalee Rotary Club to the IDPs in the village would help the returnees to resume their normal lives after more than a decade. He thanked the Rotary Club and the GTZ for this assistance. Varothia Nagar, 5 km north of Trincomalee town, which lies between Uppuveli and Kanniya stayed deserted since 1990 violence but has now become a hive of activity with the return of displaced Tamil families from Vanni and from other places to resettle in their abandoned lands. Varothia Nagar is called Rotary village, as the Trincomalee Rotary Club since 1983 has been looking after the well being of the villagers who frequently suffered due to violence. 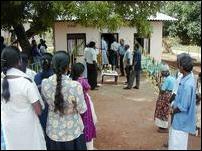 The Trincomalee Rotary Club constructed several houses and resettled the displaced families in violence that took place before 1990. In 1990 violence most of the houses in the village were destroyed. Families fled from the village to Vanni and elsewhere. More than 1500 members of 396 families lived in the village before 1990, sources said. With the ceasefire agreement came into force displaced from Varothia Nagar are returning to their lands and constructing temporary huts as they have no means to put up permanent dwellings. Trincomalee Rotary Club has again come to the rescue of the villagers by formulating a project to build permanent houses with the financial assistance of the GTZ organization. 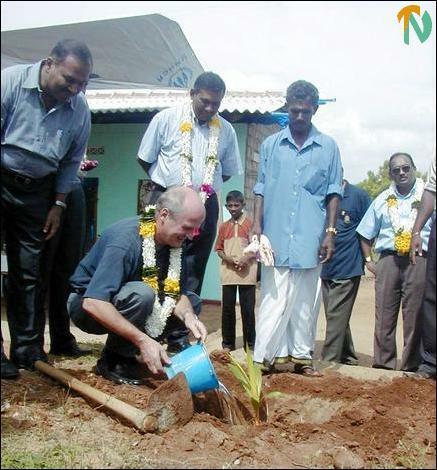 The Trincomalee Rotary Club laid foundation for a forty houses' project on February 22 this year. However only thirty houses have been constructed as five houses could not be constructed, because the returnees were unable to obtain permit for their lands from the government authorities in time, a Rotary Club official said. Each house, which costs about one hundred thousand rupees, has been constructed in a four hundred square feet plot with two rooms and a kitchen. The GTZ organization contributed eighty percent of the cost and the beneficiary the balance money to complete the work by his participation. Ms Arumugam Rajeswary, field assistant of the Trincomalee Rotary Club who supervises the beneficiaries of self-employment projects in the village. The self-employment projects include goat rearing, tailoring and other activities and have been organized by the Trincomalee Rotary Club in the village, sources said. Ms Rajeswary herself a refugee lived in Clappenburg camp at Chinabay following 1990 violence. 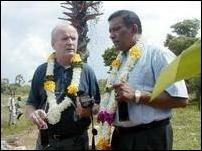 Dr.Genitz Dedo (L) and Mr.Gamini Jayawardene (R). Trincomalee Rotary Club President Mr.Rajarammohan hands over the keys to widowed mother of five children Ms Sittampalam Chandra Devi who had returned from Vanni.